Hi-Everyone, This is my first post. My wife inherited a 1967 Camaro convertible from her father. It was originally ordered by him and then it was sold and gone for over 20 years. He found it again when he retired and bought it back and now it is my wifes. I was trying to decipher some of the info on the vin plate on the firewall and was having some trouble. Any help would be appreciated. I know that he ordered the car with a 308 rear end and a 350 motor, it is an RS model but he had told me that is was ordered with a SS package and no stripes? I can dig a little further for you but here is a link to the vin plate http://sellingtoyotas.files.wordpress.com/2013/09/2013090195172048.jpg my main objective is to find out if this has original colors on interior and top? Also looking for estimated production numbers on this particular color combination. 06A = Built the First week of June. 67-12667 = Custom Interior Convertible. NOR = Built in Norwood Ohio. 779 = Custom Turquoise Bucket Seats. Z = (A50) Strato Bucket Seats. K-1 = Lower Color is Emerald Turquoise and the Convertible Top Color is White. Thanks for the information. I don't know how the heck you found out so quickly. Should I put the vin up here to check other options or would you not recommend that? The vin only shows whether a car was a V8 or L6 and coupe or convertible. There will also be a date range to indicate the cowl tag and vin match. Yes, you can post the VIN. 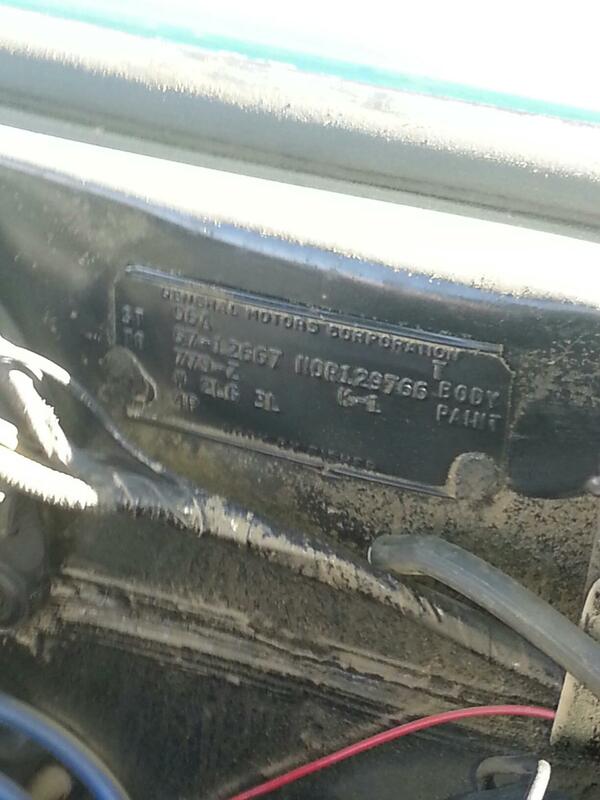 And what's stamped on the engine pad? When you say strong color combo does that mean it is rare? Here is the vin 124677N229949 Where is the engine pad? I know that the motor is not factory. Weren't '67 Pace Cars all painted the turquoise color? Is it possible that this is one of them, or was there a special code as well? I know for a fact that is wasn't a pace car. Where is the engine pad? I know that the motor is not factory. Thanks Paul. I will have to check it out this weekend. If it is a non original motor (almost 100% positive). Will I be able to tell from what vehicle it came from? Strong colors meaning it's a good combo.